In today's world, speed is everything. Software Defined Data Centers (SDDCs) enable unrivaled flexibility and efficiencies but Administrators often lack the tools needed to take advantage of all its possibilities. ReSTNSX is a quick and easy to use, HTML5 GUI driven configuration tool for VMware NSX –v and –T customers who wish to automate, simplify and accelerate the deployment of complex policies and settings in scale. In some situations, custom API calls are required to access certain capabilities. ReST NSX easily brings all the NSX features and power of custom REST API to your fingertips with no knowledge of coding. Most organizations do not have the expertise to code, deploy and maintain these custom written scripts that implement NSX REST API calls. ReSTNSX enables your organization to focus on easy policy and configuration definition for small and large deployments alike. With pre-defined workflows for NSX Network, Security and Infrastructure components, ReSTNSX enables simple API configuration through an easy to use GUI. By manually entering data, to dynamic .CSV imports, ReSTNSX provides provisioning flexibility leveraging a database driven back-end. In addition to the base API calls, ReSTNSX also provides error detection/handling to keep the experience frustration free. By ensuring compliance with the XML/JSON schema, ReSTNSX maintains ease-of-use in the face of complex API calls. ReSTNSX provides duplicate object detection for conflicting entries upon export to NSX Manager. Without ReST NSX, this equivalent functionality must be custom coded via a programming language such as Python as NSX Manager will allow duplicate objects to be injected. Customers often require a large number of NSX objects with no way to easily create and manage them. 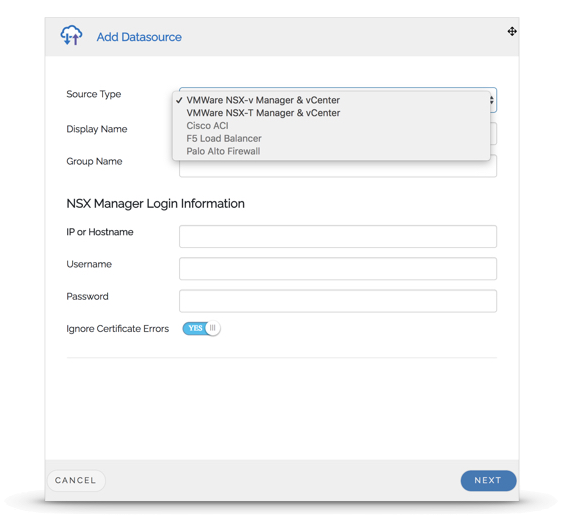 Instead of leveraging the NSX GUI for one-by-one definition, they rely upon the NSX REST API. Implementing 100's (and in some cases 1000's) of security tags requires defining each one and then linking the tags to the groups. In these scenarios, the REST API is almost a requirement. With ReSTNSX, not a single line of code is required for accessing the REST API. 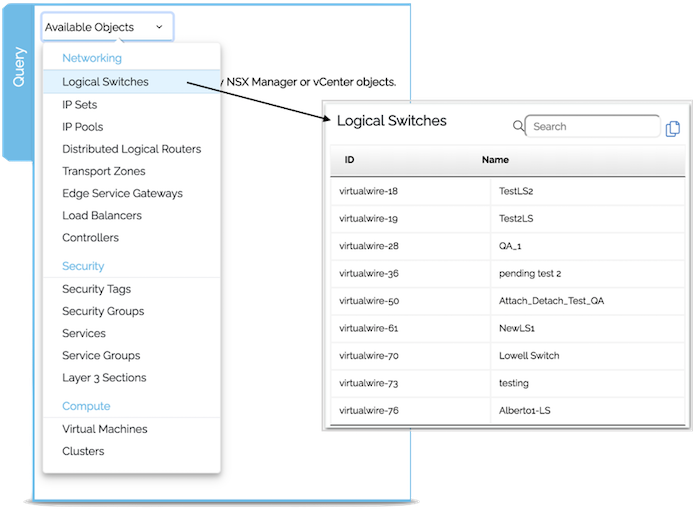 Users are able to create one or many NSX objects via a few clicks of the mouse. ReSTNSX enables creation via manual entry or .CSV. For every bulk object where .CSV is selected, a template file is created for the user to complete and upload. For some customers, creating the same objects against multiple environments such as dev / test / prod or a DR site, is very time consuming and error prone. ReSTNSX .CSV files may be used in multiple workflows or applied against multiple NSX Managers for easy and consistent object creation. The previous example highlighted the power of the administrator to easily create single or multiple objects of a single type - Security Tag, IPSet, etc... ReSTNSX workflows extends this capability where we have stitched together related objects into a single process for a simple and quick method to deploy NSX Network Virtualization and Security. By taking the guessing out of the necessary steps to deploy these technologies, ReSTNSX provides users with a process for deployment. Below is an example of the Network Virtualization workflow where the recommended tasks are presented to the user. 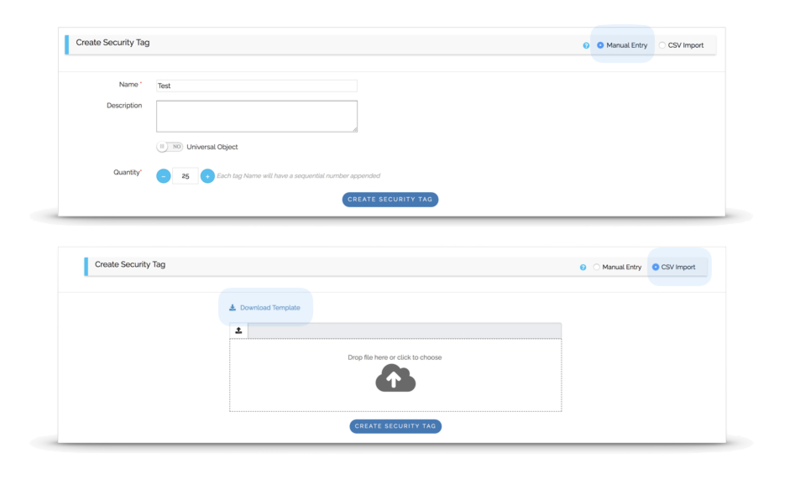 Once created and deployed to NSX Manager, users can also leverage ReSTNSX to retrieve the objects for further modifications in the same easy manner as they were created. ReSTNSX Query and Operations provides a mechanism to easily located and modify NSX objects. ReSTNSX Query enables users to locate information on any given object very quickly. From NSX objects to vCenter Virtual Machine information, Query is a simple and quick manner without needing to click around multiple places. ReSTNSX Operations was designed for quick and easy Day 2 Operations of NSX. The user is presented with a dashboard summary of the Networking & Security (N&S) Objects with the ability to create or modify in real-time. From the Dashboard, users can quickly move to any N&S object for editing, adding new or deleting. 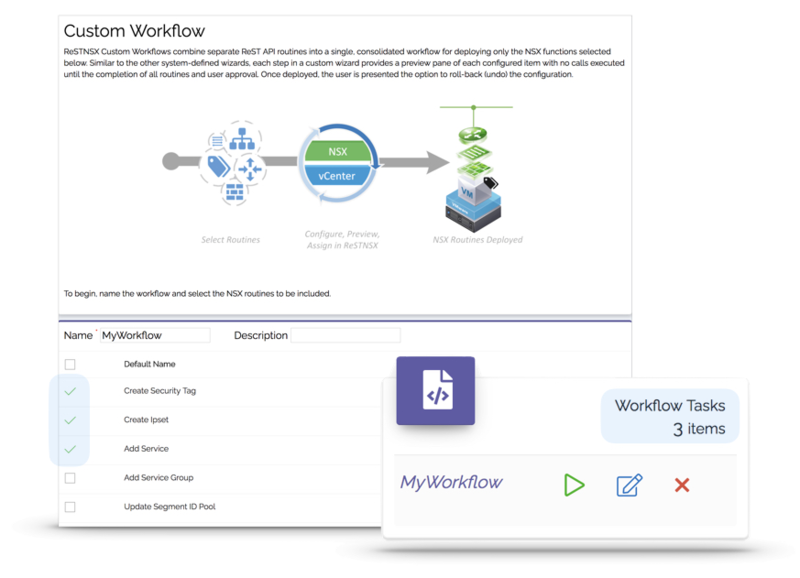 In addition to the base Network Virtualization and Security Workflows, ReSTNSX enables custom workflow creation and .CSV import based upon the objects of interest. Custom workflows allow the user the flexibility of creating a personal step-by-step workflow where only the selected items are presented for provisioning. Once created, the workflow is presented on the main system dashboard for repeated consumption. Outside of object provisioning and management, ReSTNSX has numerous other use cases that help solve real challenges. For example, VMWare does not support restoring from a full NSX backup if it is not against the same vCenter. The reason for this are that objects in NSX might be utilizing unique ID's or GUID's for objects in vCenter (ie. Security Tags attached to VM's in which the VM's GUID is unique to the vCenter inventory it is apart of). ReSTNSX has predefined wizards that allow backup of partial or all data and also allowing restore of NSX to another NSX Manager that could be attached to a completely separate vCenter. From getting object backups or provisioning between lab/dev/test/prod, ReSTNSX allows Administrators that flexibility. Here we see an example of the flexibility of ReSTNSX and the NSX Mover tool. Within a few clicks, an administrator can migrate (copy) an object or firewall ruleset between environments. Below is a very simple example of an IPSet moving from a 6.3 NSX Manager to a 6.4 or NSX-T environment. ReSTNSX will validate the object is supported in the destination environment prior to attempting a migration. Once the user selects Migrate, the object is created on the destination NSX Manager immediately. NSX Mover is available for single, bulk or multiple object types for easy migration and synchronization between environments. 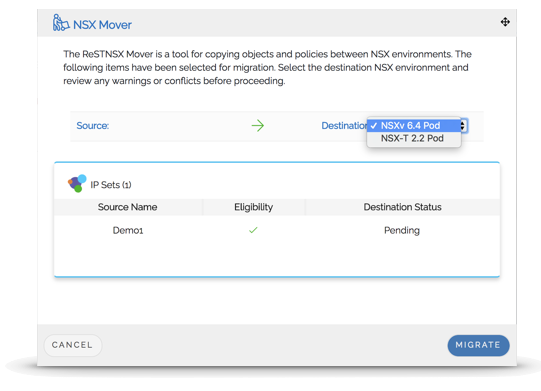 While similar functionality can be achieved in one of ReSTNSX's predefined API calls or workflows, NSX Mover in Operations provides a quick and easy method for migration of objects and policies. ReSTNSX also supports multiple data sources under a single management interface. This allows ReSTNSX to provide simple API support for 3rd party* solutions and multiple NSX Managers under a single user interface. In just a few clicks, an administrator can add a new data source to be managed by ReSTNSX.